Tucked deep into the forest is one of the most magical castles in Germany. Eltz Castle is like no other castle in Germany as you won’t see it perched high up on the hill miles before arriving. As soon we saw a picture of Burg Eltz we added it on our German castle list to visit. It may not be on the famous Romantic Road which visits some of the best castles in Germany but it’s definitely worth the detour. We’ve put together everything you need to know about visiting Eltz. This medieval castle was built in the 12th century and has been owned by the same family for over 850 years. The castle was named after the stream Eltzbach, which in old German Els/Else is the name for Black Alder a tree that is found along the river. Eltz is one of only three castles on the left bank of the Rhine River that hasn’t been destroyed over the centuries. Construction started in 1157 and building lasted 500 years, with ongoing maintenance to keep the castle up. There are over 100 rooms in the castle for family members, staff, and guests. The easiest way is by car and if you are visiting on the weekend’s public transportation is an option April-November. If you’re traveling around Germany by train on rail pass you can get off at Treis-Karden at the Hatzenport train station and take a taxi or the castle bus if on the weekends. By Car: If you have data on your cell phone all you need to do is but in Burg Eltz into Google Maps and it’ll bring you right to the castle in Germany. Otherwise, enter the below address into maps before leaving your hotel with Wi-Fi. Google maps will bring you right to this epic German castle even if you’re offline as long as you start navigation before leaving Wi-Fi. Once you get close to the castle you’ll start to brown signs for Burg Eltz, you can follow those signs as well. When we visited our GPS went a different way than the signs so don’t be alarmed if your GPS tells you to go a different way than the castle road signs. Renting a car in Germany is the best way to see the country and visit some of the best castles in Germany. We have rented a car 5 times in Germany and can’t imagine not having that freedom. Often cars are less than $25 a day, we book on Rentalcars.com they have the best prices and free cancelation. Click here to check rates. By Bus: From May to November on Saturday, Sunday, and public holidays you can catch the Burgenbus 330 also known as the Castle bus. The Burgen bus runs four times a day from Treis-Karden To Eltz Castle stopping in Pyrmont Castle and Hatzenport. Walking: If you’re up to a hike it’s only 3.3 miles (5.3 km) from the Hatzenport train station and should take around 80 minutes. The trail is well marked with signs. 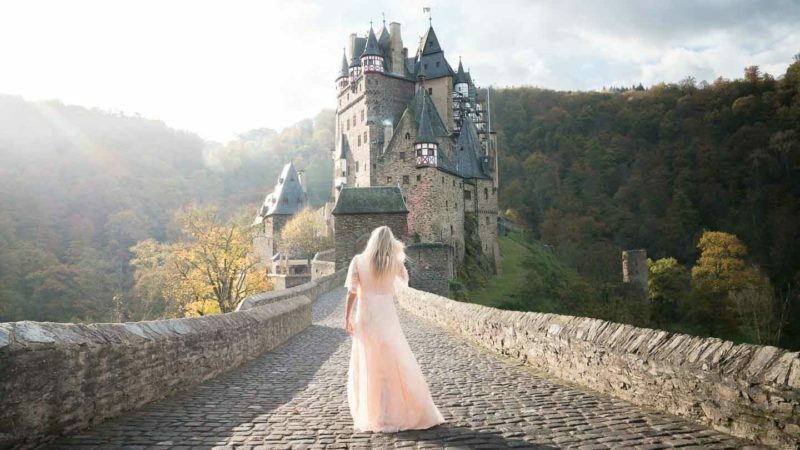 Come Early the castle officially opens at 9:30 am but we suggest getting here earlier to get the iconic Eltz Castle bridge photos without a bunch of people in the photo. We noticed the tourist buses started arriving at 10:30 am. There are two ways to walk to Eltz Castle you can either walk the paved road (800 meters about a 10-minute walk) which the shuttle bus takes or a footpath by the lower car park (0.75 miles about a 15-minute walk) through the forest. 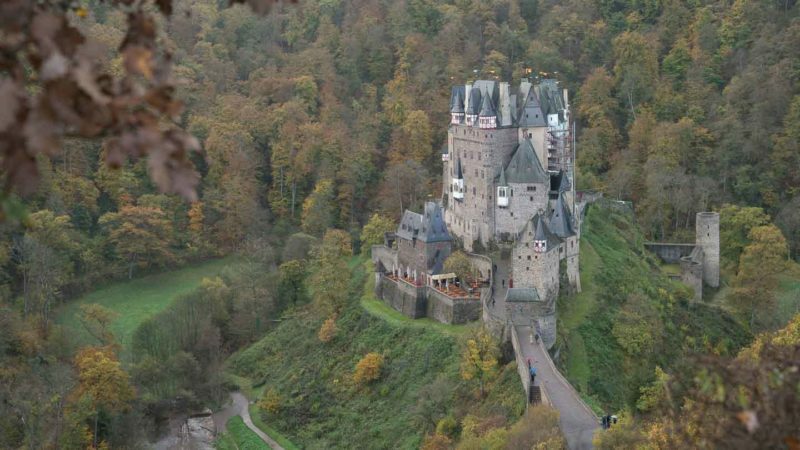 We suggest taking the paved road to Burg Eltz and along the way, there is a viewpoint looking down at the castle and on the way back to the parking lot take the footpath through the forest. No photos allowed inside the castle – You can take as many photos outside but as soon as you enter the castle no photos are allowed and there isn’t any photo pass you can purchase either. No drones allowed at Eltz Castle – we weren’t surprised by this. We saw multiple signs saying no drone in German and English. The fines for flying a drone illegally in German are no joke, it’s not worth the risk. For the best photo of Eltz Castle from above head viewpoint just off the paved road to the castle near the white shelter and old ruins on top of the hill. Pets are not allowed indoors at Eltz Castle, for some reason at every castle in Germany we noticed a bunch of dogs. Dogs are allowed at Eltz but they are NOT allowed inside during the castle tour. There are two restaurants skip the drive-thru and instead have a meal in a castle. The restaurants are reasonably priced and serve coffee, sandwiches, Schnitzel, salads, soups, brats, and much more. Burg Eltz is open daily April through November 9:30 am to 5:30 pm for castle tours. If you happen to visit the castle outside of these months you can still visit Eltz castle you just won’t be able to go inside the castle for a tour. Even if you can’t go inside the castle is still worth the visit. Most castles in Germany are perched high up on a hill but Eltz is hidden deep in the woods surrounded by nature. Technically there isn’t a fee to visit Burg Eltz. However, there is a €2 parking fee and €10 an adult for the guided castle tour. If you are short on time you can catch the shuttle bus from the parking lot next to the Antonius Chapel, it €2 per person each way. The shuttle bus will drop you off right at the iconic bridge entering Eltz castle. The only way you can go inside the castle is to go on a guided tour. Tours typically take 45 minutes and run every 10-15 minutes. It’s best to head to the ticket counter first and find out when the next tour is in your desired language. English tours are available but you may have to wait for a little so it’s best to find out when the next tour is and then take photos while you wait. Q: When was Burg Eltz built? Q: Who owns Eltz castle? A: Berg Eltz is still owned by descendants of the Eltz Family who date back to this region since the 7th century. Q: How many rooms in Eltz Castle? A: The castle has over 100 rooms in the Berg Eltz interior. Q: What is the German word for Castle? A: The German word for castle is Berg or Schloss. We suggest staying at a hotel nearby so you can get to Eltz right away in the morning to beat the crowds. There are several cute hotels in the area to call home for the night. Also check Airbnb, as there are some really cute German houses and even castles for rent. You can rent an entire house with 6 beds and a sauna for less than a standard hotel room. On our last trip to Germany, we only stayed in Airbnbs and 3 were German castle Airbnb. Click here for $40 off your Airbnb! There are over 20,000 castles in Germany and several castles nearby Eltz that are worth the visit. Here are a few to Castles to consider visiting before or after Burg Eltz. Another one of our favorite castles in Liechtenstein Castle, which is just under 4 hours away. If you have time put it on your Germany road trip. Go early before they open so you can clean shots. On the hike to the castle on the road there is a little hill/viewing area where you can look down onto the castle. I would suggest an hour before Eltz Castle opens would be the best time to go. Hope you get some great photos of Eltz Castle. Locating and then visiting castles is always on my to do list in any destination. Nice reading your post and lovely photos too. If you like visiting castle then you have to head to Eltz Castle. The highlight of our recent trip to Europe was visiting a bunch of castles in Germany. You won’t be disappointed! Can anyone tell me if its accessible in a camping car? We are going to tour Germany next summer and we would love to visit this castle. Yes, this German castle is not too far off of the main highway with good roads all the way to the castle. Any car can reach Eltz Castle. Safe Travels. Eltz Castle is one of prettiest castles in Germany, def our favorite. Glad we could help plan your trip there! Great comprehensive post – you’ve answered all my questions about visiting one of Europes’ most gorgeous castles. Thanks for sharing! Another favorite of mine is Vianden just across the border in Luxembourg. Glad we could help plan the perfect trip to Eltz! Next time we travel to Europe we’ll have to check out Vianden Castle, never heard of it before. I could leave tomorrow and not worry about planning anything. How much time does it take to visit the castle? Would it be half a day or an entire day? No problem, that’s what we are here for. The time really depends on if you the castle is open and you want to take the castle tour or not. Do you want to eat lunch at Eltz castle or not? We would suggest about 30 minutes for photos outside the castle and on the hike with viewpoints, we probably spent an 1-hour taking photos outside of Burg Eltz before going in. The earlier you get the better, that way you don’t have to wait for people not to be in your photo. I’d say 2-3 hours if you do the tour and grab a bite to eat. 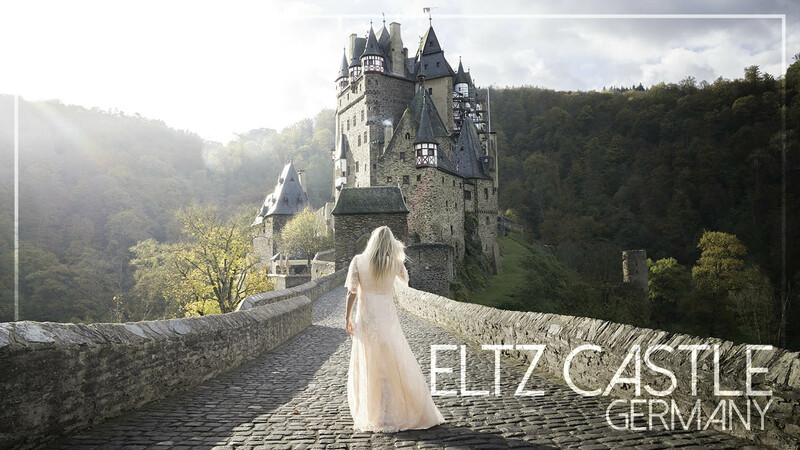 Planning your trip to Eltz Castle should really be timed because we all know everyone wants the shot on the bride without others in it. This can easily be done and that’s why we wrote this article! Glad we could help. Wow this castle looks really stunning.thanks for sharing a detailed information and suggestions. Eltz Castle is super stunning and our favorite castle in Germany for sure. Do you have any Germany travel plans in the near future? Thanks Hannah – I think it’ll be weather dependent – if it’s tonking it with rain then we may just give it a miss. We’ve promised ourselves to return in the summer – maybe do the Castle route, or the Romantic Road. Either way, we’ve plenty more of Germany we want to explore. We hope the weather is in your favor and you make it out to Eltz Castle. It’s an amazing road trip either one you pick. Safe travels in Germany! 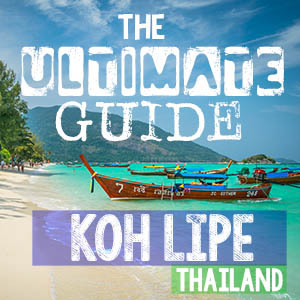 A great read, and a some great trips. We might add it to itinerary for our Christmas Markets Road trip in about 3 weeks’ time. The last leg is Frankfurt to Cologne, so a slight detour can take us via Burg Eltz – let’s see what the weather holds for us. You definitely should visit some of the best castles in Germany and make that detour to Burg Eltz castle it’s totally worth it. The Christmas markets in Germany are some of the best. We did a Christmas market cruise down the Danube with Viking River cruise two years ago. The weather was cold but we still had an amazing time. Safe travels and happy holidays.